The modern and well planned work spaces of DLF iQ lend a distinctive appeal to this aesthetically designed architectural wonder. A LEED Platinum Certified building, it’s spread over approx. 2.03 mn sq. 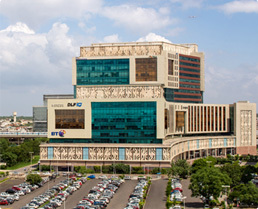 ft. and has 4 interconnected blocks, each block offering an intelligent IT/ITES SEZ workplace to new age professionals. Benchmarked to global standards, the smartly designed work spaces will be instrumental in transforming your work life to a considerable extent. The office blocks are designed to ensure a dynamic interplay of open and enclosed spaces. The overall development has a campus feel, with buildings and landscape visually integrated in to one complete environment. IT SEZs in India under the guidelines of SEZ Act are offering huge tax incentives for the cost competitive IT/ITES industry. 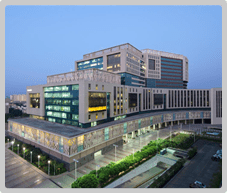 DLF, the largest real estate developer in India, is aggressively pursuing the development of IT SEZs across India. Custom & Excise duty benefits. Income Tax exemption for SEZ units. Exemption from Service Tax, Stamp Duty etc. (*As per the SEZ policy of Government, www.sezindia.nic.in).